I was driving home with a co-worker and the conditions were icy. I came up to the exit for the Gardiner Expressway from HWY-427 and had to drive over a hill. The other side of the hill was a collection of emergency vehicles (fire trucks, ambulances, police cars) as well as tow trucks. They were there dealing with the multiple crashes that had happened in front of me. I soon saw why! Directly over the hill was a sheet of black ice. Even with snow-tires and driving very slow, there is nothing you can do once you hit the ice. I tried to steer one way, then the other, but by then I knew we were going to hit another car in front of us, which was almost stopped. No one was hurt in the accident, but my car hit the other car twice. Once on the front passenger side, then the back passenger side as my car 'fish-tailed'. The tow-truck took us to the Accident Reporting Centre and I had to fill out some forms and contact my insurance company. I am going to get the car fixed by a body shop and the entire thing will be covered by the insurance. I am sure my premiums will be affected. I am collecting a courtesy car tomorrow, which I'll need for a couple of weeks while my car is getting fixed. 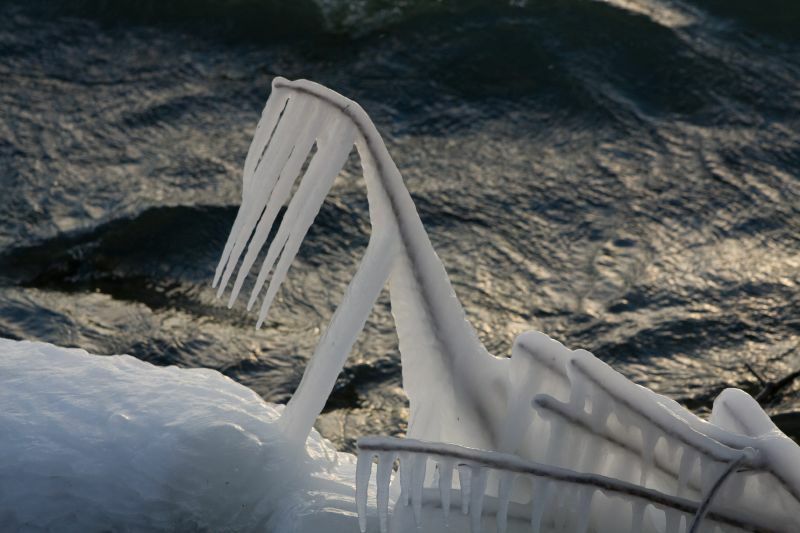 I've included a suitable photo: Very cold weather in GTA with icicles forming at the Lakeshore.